A really beautiful ensemble. I love the front design of the sweater and the little trail on the skirt. Wonderfully lovely ensemble! 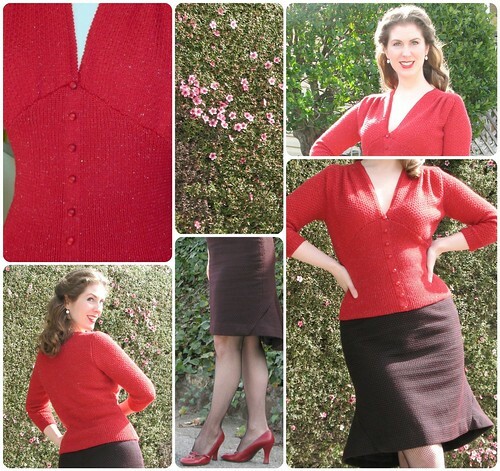 I agree, a sweater that smashing does deserve a new skirt and what a beaut this one is! This is a beautiful outfit! The two pieces go together so well, that sweater definitely deserves a skirt like that! That length skirt looks perfect on you. You do not need to have it mid knee. I did end up happy with the length in this wool fabric when paired with some leg covering. At work I am often seated which pulls the skirt up a bit - and no one needs to see that much pasty skin! So a summer version will need some added length. The whole outfit is fantastic, i love the mermaid shape of the skirt. I can see it looking more vintage at a longer length but think this length is very sassy! "Sassy" - I like that!